An appeal against a decision in summary proceedings is not so easy anymore as it used to be. In former times, a not easily repairable harm had routinely be assumed on appeal against decisions concerning interim injunctive relief (see BGE 134 I 83, ¶3.1, with further reference). However, the more recent case law requires that the appellant is threatened by a not easily repairable harm (in legal terms) in the specific case at hand; see BGE 144 III 475, ¶1.2, with further reference). In the case at hand, the Supreme Court left it undecided whether the loss of the first mover advantage or reputational damages would be sufficient to meet the threshold. But the Supreme Court noted that the interim injunctive relief also prohibited possession and storage, and the defendant would thus have to destroy all products on stock. The Supreme Court held that this constitutes a not easily repairable harm in the sense of Art. 93(1) lit. a SCA, and the appeal was admissible already for this reason. This surely is lawyer’s playground; but I am wondering why the loss of stock was considered a not easily repairable harm? It surely is a harm. But wouldn’t it be one of the kind that is quite easy to repair? Further, Sandoz had argued that the plaintiff was not actually at risk of a ‘not easily repairable harm’ as required by Art. 261(1) lit. b CPC. 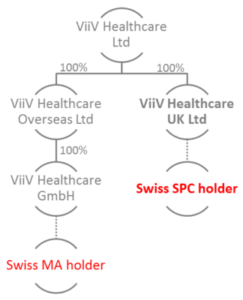 In brief, plaintiff ViiV Healthcare UK Ltd is the holder of the Swiss SPC, and is fully owned by ViiV Healthcare Ltd; cf the right branch of the illustration. Likewise, ViiV Healthcare GmbH (holder of the Swiss MA for Kivexa® according to the ‘Spezialitätenliste‘) is fully owned by ViiV Healthcare Overseas Ltd, which in turn is fully owned by ViiV Healthcare Ltd; cf the left branch of the illustration. The FPC had held that a not easily repairable harm was sufficiently credible; it was ‘obvious and notorious’ that in such group structures of pharmaceutical companies a disadvantage that cannot be easily repaired arises for the group and thus at least indirectly also for the formal holder of the SPC. The FPC failed to see why / to what extent this should not be the case in the present setup. The Supreme Court essentially confirmed this reasoning. 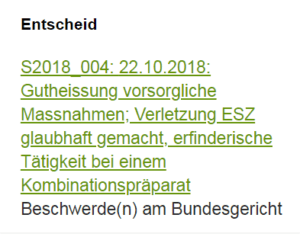 […], wird in der Botschaft zur ZPO ausgeführt, jede Beeinträchtigung in der Ausübung absoluter Rechte bedeute einen nicht leicht wieder gutzumachenden Nachteil ([…]). Als Nachteil gilt beispielsweise eine Beeinträchtigung der Ausübung absoluter Rechte (z.B. Störung des Eigentums). Die Beschwerdeführerin stellt zu Recht nicht in Frage, dass auf die Praxis der Beschwerdekammern des EPA abgestellt werden kann. 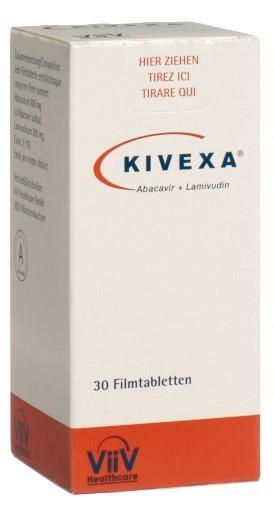 [Abacavir] may be administered alone or in combination with […] Nucleoside Reverse Transcriptase Inhibitors (NRTIs) for example zidovudine, zalcitabine, lamivudine, didanosine, stavudine, 5-chloro-2′,3′-dideoxy-3′-fluorouridine and (2R,5S)-5-fluoro-1-[2-(hydroxymethyl)-1,3-oxathiolan-5-yl]cytosine; non-NRTIs for example nevirapine and α-APA; HIV protease inhibitors for example saquinavir; other anti-HIV agents for example soluble CD4; immune modulators for example interleukin II, erythyropoetin, tucaresol; and interferons for example a-interferon. Now, does it require a multiple selection from two lists of certain lengths to arrive at the combination of abacavir and lamivudine, in accordance with the established case-law of the Boards of Appeal of the EPO? 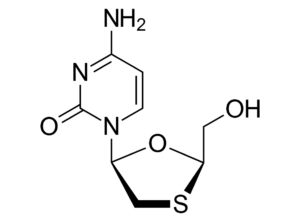 Does one have to first choose a generic class (NRTIs) and then lamivudine within that class — or does one just have to pick one compound from a single (structured) list of compounds? A decision on that question could have been a very interesting read. But the Supreme Court merely held that the FPC could well assume, without becoming arbitrary, that it would still require a twofold choice and thus a multiple selection from D1. Selbst wenn daher die Rüge der Beschwerdeführerin begründet wäre (was offen bleiben kann), dass die im angefochtenen Entscheid genannte erste Auswahl keine relevante Wahl im Sinne der Rechtsprechung sein sollte [Anm. : Mono- bzw. Kombinationstherapie], konnte die Vorinstanz ohne in Willkür zu verfallen davon ausgehen, es erfordere immer noch eine zweifache Wahl und damit eine Mehrfachauswahl aus [D1], um zum Gegenstand des Patents der Beschwerdegegnerin zu gelangen. Infringement of ViiV‘s SPC based on EP 0 817 637 B1 is at stake. See EPO Register and Swissreg for bibliographic details of the patent; and Swissreg for further bibliographic details of the SPC C00817637/01. A combination comprising [abacavir; ABC] or a physiologically functional derivative thereof and [lamivudine; 3TC] or a physiologically functional derivative thereof. 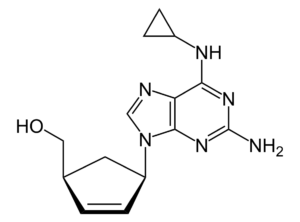 Both these compounds are nucleoside reverse-transcriptase inhibitors (NRTIs). Both compounds alone and the fixed-dose combination thereof are included in the WHO Model List of Essential Medicines. ViiV‘s own product is Kivexa® (aka Epzicom® in the U.S.); see compendium.ch. 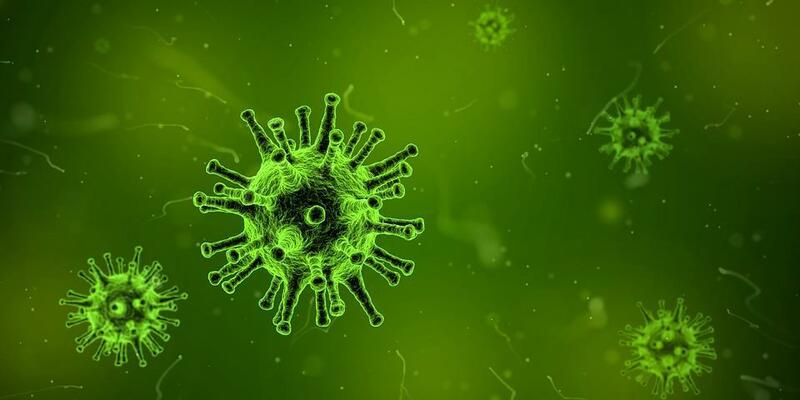 The European public assessment report (EPAR) of the European Medicines Agency (EMA) provides a wealth of further information about this antiretroviral combination therapy for the treatment of Human Immunodeficiency Virus (HIV) infection. 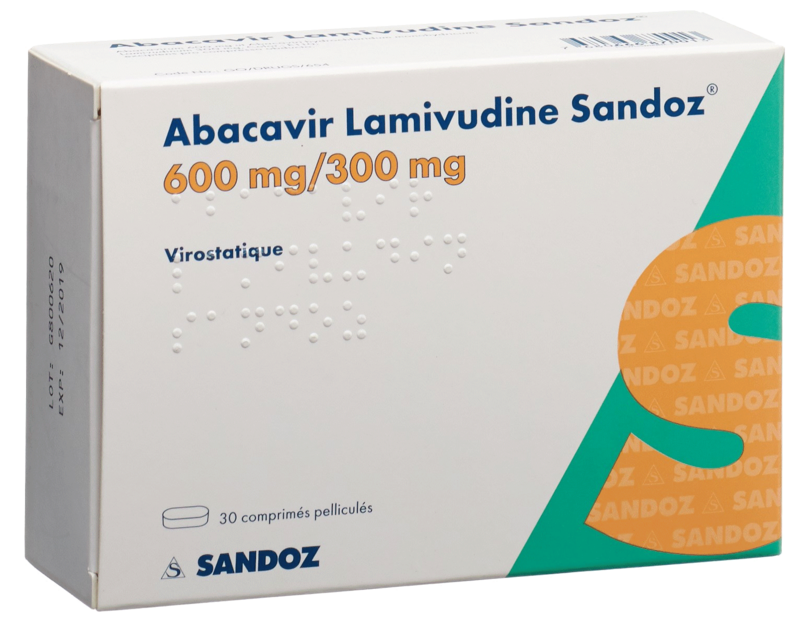 Sandoz‘s generic version ‘Abacavir Lamivudine Sandoz®’ had obtained market approval on December 15, 2017, and it has been listed since April 1, 2018; see compendium.ch. Sandoz contests infringement of the SPC solely on the ground that EP’637 and the SPC are null and void. A lack of novelty and inventive step is alleged, and that the priority claim was not valid. Sandoz had refused to undertake not to put the product on the market before the expiry of the SPC (October 30, 2020); Sandoz rather informed ViiV that it would start marketing in calendar week 21 — and has consequently been sued by ViiV. I have attended the hearing yesterday; see the official announcement and some live notes below. Is EP’637 entitled to the priorities claimed? The parties dissent about whether or not EP’637 is actually entitled to the priorities claimed; see a compilation of the two priority documents here. Respondent argued that the whole disclosure of the priority documents is about a combination of three active substances, compared to a combination of only ABC and 3TC finally claimed in the patent in suit; plaintiff disagreed. If priority was not validly claimed, D1 (WO 96/06844) would be pre-published prior art, i.e. relevant for both novelty and inventive step assessment. Has D1 (WO 96/06844) to be considered in the assessment of novelty? From the pleadings, I conclude that in the exchange of briefs the plaintiff himself had submitted that D1 (WO 96/06844) forms prior art that is (only) relevant for the assessment of novelty. Respondent had agreed. Only later, in my understanding in the judge-rapporteur’s expert opinion, it has been held that D1 does not form part of the prior art under Art. 54(3) and (4) EPC 1973 or Art. 7(3) lit. a old PatA, respectively. Respondent disagrees on the merits, and further argued that the principle of party disposition was violated. Is D1 (WO 96/06844) novelty destroying? From the pleadings it could be concluded that the expert opinion established by the judge-rapporteur was advantageous for the plaintiff, i.e. that novelty of EP’637 over D1 was given. The EPO’s approach of how to deal with selections from two or more lists of a certain length will be decisive. Respondent argued that the German Federal Patent Court and a Stockholm court had denied novelty. I could not yet spot any such decision; maybe these were only interim assessments of the courts before the respective parties settled(?). If you know more, I would be grateful if you would let me know. I have meanwhile been informed of the decision issued in Sweden (Case PMÖ 3565-17 of the Svea Hovrätt), briefly reviewed on EPLAW Blog. An ‘optional’ disclaimer in summary infringement proceedings? In a secondary line of defense, plaintiff offered to limit the patent with a disclaimer, to exclude the disclosure of D1 and to restore novelty if necessary. Im Massnahmeverfahren [kann] sich der Kläger somit nur auf ein Zertifikat bzw. 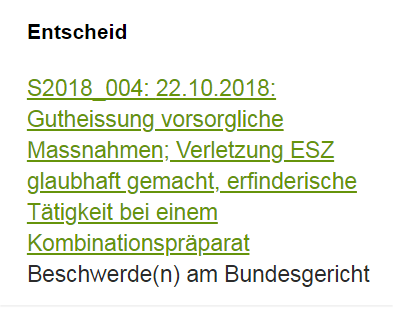 das diesem zugrundeliegende Patent in der aktuellen (d.h. uneingeschränkten) Fassung berufen. 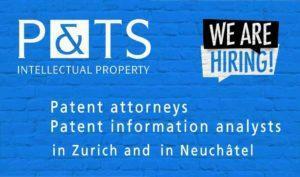 In summary proceedings the plaintiff may thus only rely on the SPC or the basic patent, respectively, in its current (i.e. unamended) version. 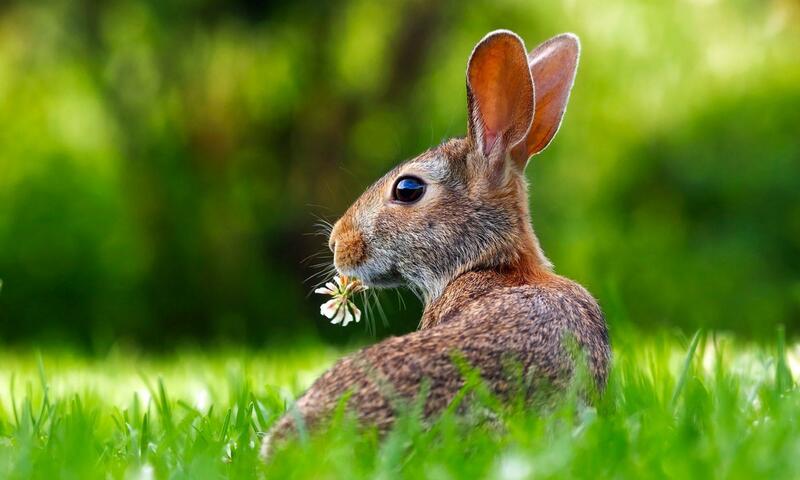 Risk of a not easily reparable harm for the plaintiff? Further, the requirement of a ‘not easily reparable harm’ for interim injunctive relief to be granted has been addressed at length by the parties. Is the plaintiff actually at risk of a ‘not easily reparable harm’ as required by Art. 261(1) lit. b CPC? Respondent firmly insisted that this is not the case, with reference to an illustration similar to the one shown on the right. 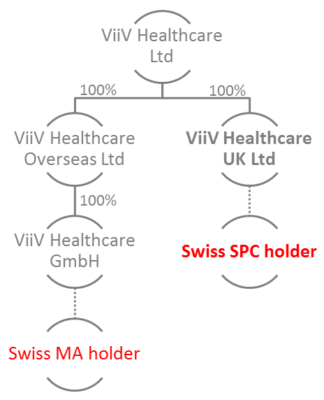 In brief, plaintiff ViiV Healthcare UK Ltd is the holder of the Swiss SPC, and is fully owned by ViiV Healthcare Ltd; cf the right branch of the illustration. Respondent argued that none of the boilerplate arguments like confusion of the market, price erosion, etc can apply here, since this does not affect the plaintiff / SPC holder. Plaintiff inter alia argued in the hearing that the Swiss MA holder has a license under SPC. This was firmly rebutted by the respondent as ‘not true’, or at least not to be a royalty-bearing license — and procedurally belated in any event. In my understanding, it had not been argued in the written exchange of briefs that a license is in place. Finally, the parties were asked whether they were interested in settlement discussions. I would have loved to hear the answer, but the public has been excluded on request of the plaintiff even before the general (un)willingness to talk settlement has been indicated.